Is there someone you always wanted to meet? Did a person in recent or distant history have a huge positive impact on your life or culture? Is there a legend or a hero (past or present) who inspires you? What’s a “legend?” According to the dictionary, it’s a story from the past that is believed by many people but cannot be proved to be true OR a famous or important person who is known for doing something. What’s a “hero,” or the female version, a “heroine?” He or she is a person of any age who inspires you! Make sure the entry conveys why you have chosen the legend or hero (male or female) and why you think that the person is important. Inspire us! Format: Write a letter to your hero (male or female), or a poem about a legend or hero. Letters, poems, spoken word submissions are all acceptable and can be written in anyone’s voice– get creative — video submissions are permitted but not required. Schools of the GRAND PRIZE WINNERS of the Writing Challenge will receive a $1,000 grant for materials for the school –only schools on the Pine Ridge Reservation are eligible for this award. Format: Create an original drawing, painting or multimedia piece of art related to your legend or hero — which conveys a message either through symbolism or words. Do you have a favorite quote from your legend or hero? What does your legend or stand for? Materials used to create the entry are less important than the drawing itself and its message– look at last year’s winners to get an idea of the broad range of artistic expression! Entrants must be residents of Pine Ridge Reservation, and able to prove their residency to the satisfaction of the judges. Young Adults and Experienced Artists who reside on Pine Ridge Reservation and attend school full-time at schools off the reservation are eligible to enter. Young Adults and Experienced Artists who reside on Pine Ridge Reservation but are not enrolled in school are eligible and encouraged to apply! 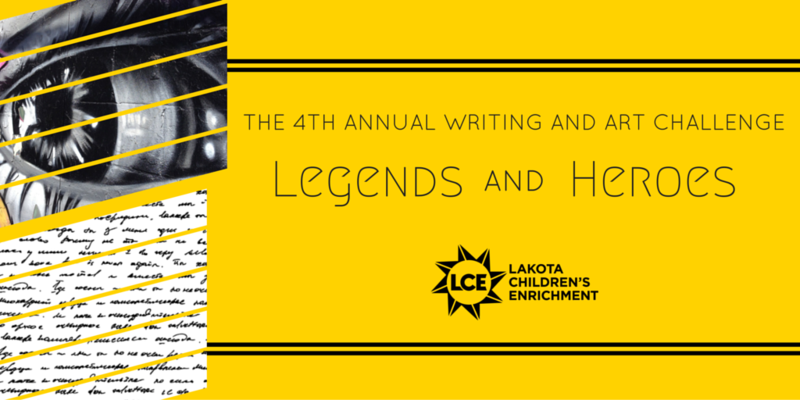 All entries must be submitted electronically by 11:59 PM on May 20, 2016 to info@lakotachildren.org or through the ONLINE ENTRY FORM on our website. If entry is a video, then provide a link to your video, along will all other required information. Runners Up may be awarded in any categories, at the judges’ discretion, and will be awarded $100 prizes. All entries must be accompanied by multiple methods for contacting winners: email address of self, parents, teachers, phone numbers, etc. If do not hear back from you, then your prize will be given to someone else. Please see our ONLINE ENTRY FORM for all information which must be submitted with your entry. By entering this Challenge, you represent that your entry is 100% your own original work and that you own all rights to the submitted materials. Once submitted, the poem, art work, audio and/or video will become the exclusive property of LCE. By entering, you grant LCE and anyone it may authorize permission to display your entry and biographical information. As a condition of entry, you irrevocably grant to LCE and their affiliates, legal representatives, assigns, agents and licensees a worldwide, royalty-free, non-exclusive, sublicensable, unconditional, perpetual and transferable right and license to use the entry in any manner, and entrants forfeit rights of privacy, intellectual property rights or other legal or moral rights that would preclude LCE from using the Contest Entry Material for promotional purposes and agree to never sue or assert any claim against the LCE’s use or distribution of those Materials. Any personal information supplied by entrant to YouTube or Vimeo will be subject to YouTube or Vimeo’s privacy policies. If you are under 18 years old, a parent or guardian who has consented to the terms of this challenge must be identified in the entry, along with valid contact information for the consenting parent or guardian. Meet the 2016 Judges! We’re impressed, we hope you are, too! READ LCE Writing Judge Peter Balakian’s guide to writing a good poem! You might to read selected entries from the 2014 Voices of the Land Collection on Medium. You might want to read selected entries from the 2015 #WeAreHere Writing Challenge on Medium: The Middle School Collection and the High School Collection. You might want to see the winning entries from the 2015 Art Challenge!